Two men went up into the temple to pray; the one was a pharisee, and the other a publican. The pharisee standing, prayed thus with himself: O God, I give Thee thanks that I am not as the rest of men, extortioners, unjust, adulterers; as also is this publican. I fast twice in the week; I give tithes of all that I possess. And the publican standing afar off would not so much as lift up his eyes towards heaven, but struck his breast saying: O God, be merciful to me a sinner. I was blessed this weekend during Mass with a very brief, but beautiful, moment. A spiritual consolation. It came during the Gospel reading. To preface, my family and I attend a parish which offers the Mass in both the Extraordinary and Ordinary Forms. 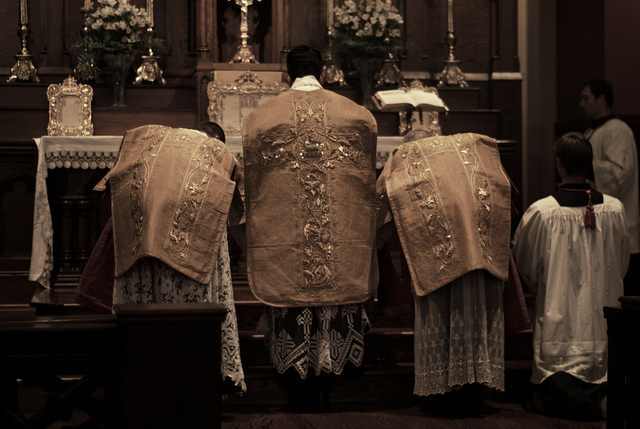 Most weekends we choose to attend the Extraordinary Form, or Traditional Latin Mass. This past Sunday was the 10th Sunday after Pentecost on the old Liturgical Calendar. The reading was the parable of the Pharisee and the Publican. As Father read the Gospel in Latin I followed along in my Missal. When we read about the humility of the publican and his prayer “O God, be merciful to me a sinner”, I found myself choking up; moved by the scripture. It was a brief moment, gone in an instant. I thought about how much I wished I was the publican and not the pharisee in this parable. Truth be told, I am far more often the pharisee. My fallen human nature has often manifested itself in that most foundational of sins: Pride. At times I am too comfortable with my own sense of piety, much like the pharisee. The profound humility expressed in this simple aspiration of the publican can serve as an entire treatise on prayer for those like myself who are afflicted with pride. In such shame and regret for his sinful ways, the publican “would not so much as lift up his eyes towards heaven, but struck his breast”. True contrition. Within the liturgy we find the same need to confess and to ask for God’s mercy in the Confiteor. Our Holy Mother the Church grants us such means to be forgiven of our sins: first, for mortal sins, the Sacrament of Reconciliation (or Penance); additionally, for venial sins, the Holy Sacrifice of the Mass. Mercy will be shown to us if we simply approach our Lord with the sincere humility and true contrition demonstrated by the publican. I confess to Almighty God, to blessed Mary ever Virgin, to blessed Michael the Archangel, to blessed John the Baptist, to the holy Apostles Peter and Paul, to all the Saints, and to you, brethren, that I have sinned exceedingly in thought, word and deed: through my fault, through my fault, through my most grievous fault. Therefore I beseech blessed Mary ever Virgin, blessed Michael the Archangel, blessed John the Baptist, the holy Apostles Peter and Paul, all the Saints, and you, brethren, to pray for me to the Lord our God.